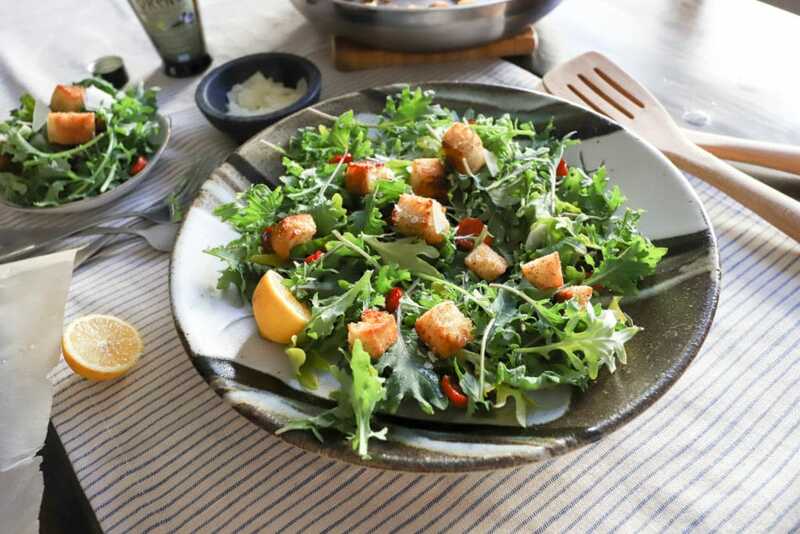 Welcome to the salad that makes my dreams come true via buttery bread cubes on top of a superfood. This salad. It’s definitely a new favorite, and the simplicity of the salad itself is one of the reasons I love it so much. I love salads that are dressed super simply to make way for really good toppings, and this is exactly that type of thing. The “dressing” is lemon juice and olive oil, full stop, but just wait for the croutons. I didn’t want to do a kale Caesar because, while delicious, I feel like that’s been done a lot. Instead, I wanted more of a make-ahead salad that just gets thrown together at the last minute. Enter: Caesar croutons. 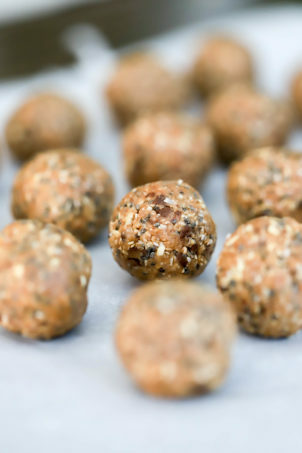 They’re made in a skillet with anchovy butter, which gives a promise-not-fishy super distinctive Caesar flavor. 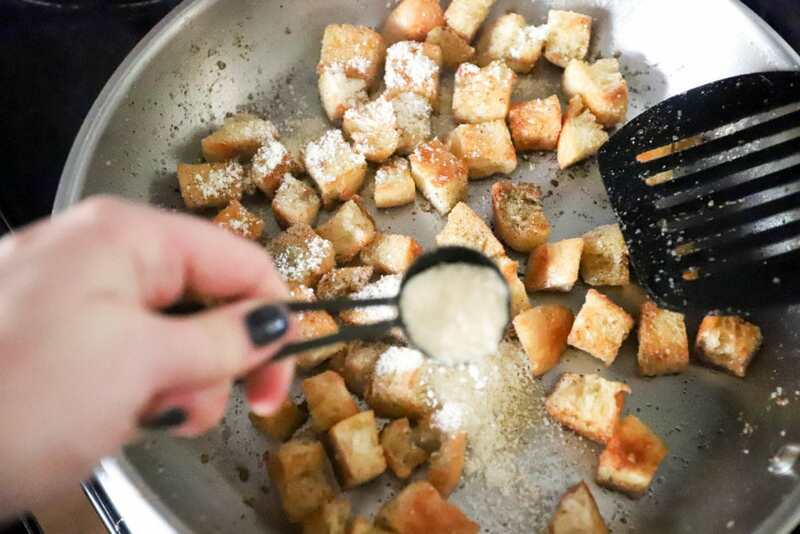 The croutons get all crispy in the butter with garlic and salt and pepper, and then right at the last minute we add parmesan which fries on the outside of the croutons and OMG. So you see why we don’t need much in the way of dressing. Roasted tomatoes add a sweet + warm element, and we have ourselves a salad. 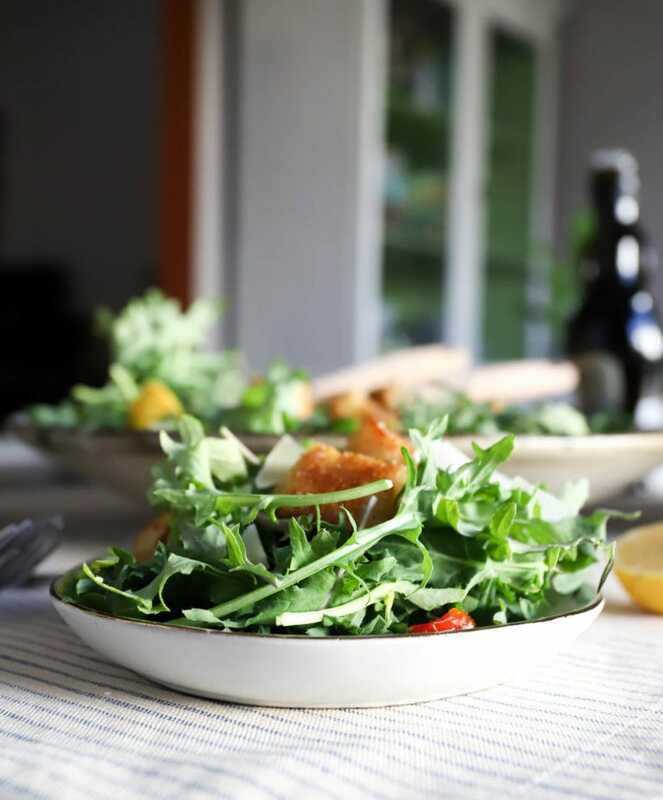 The tomatoes and croutons can be made in advance and served cold or at room temperature, so the salad can be done in five minutes once those two things are done. 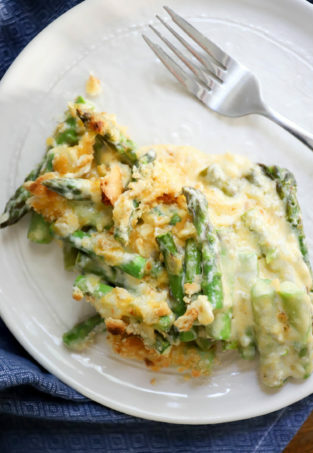 I love this as a side salad with spaghetti or pizza, but throw a fried egg or some protein on top of this and WHAT a delicious meal. Sliced rare steak sounds particularly delicious with these flavors. To get this all done in about 30 minutes, I start with the tomatoes. 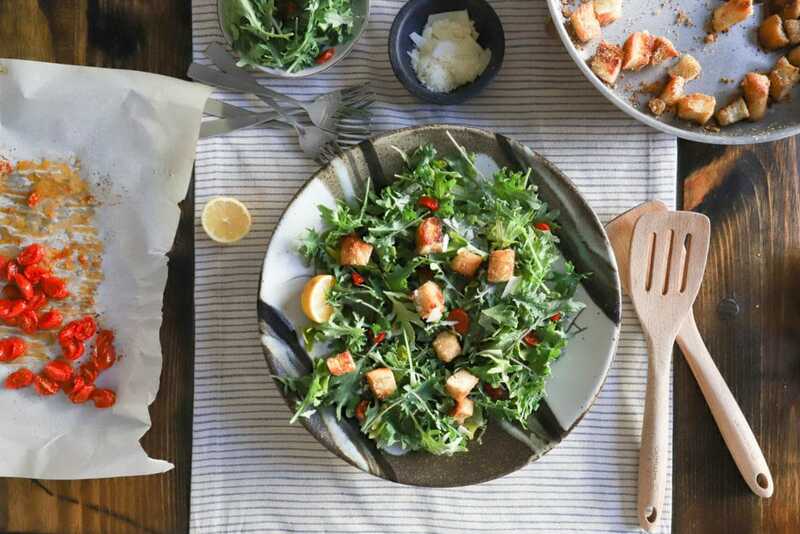 While they’re roasting I toast up the croutons and gather the salad ingredients, then throw it all together to eat. 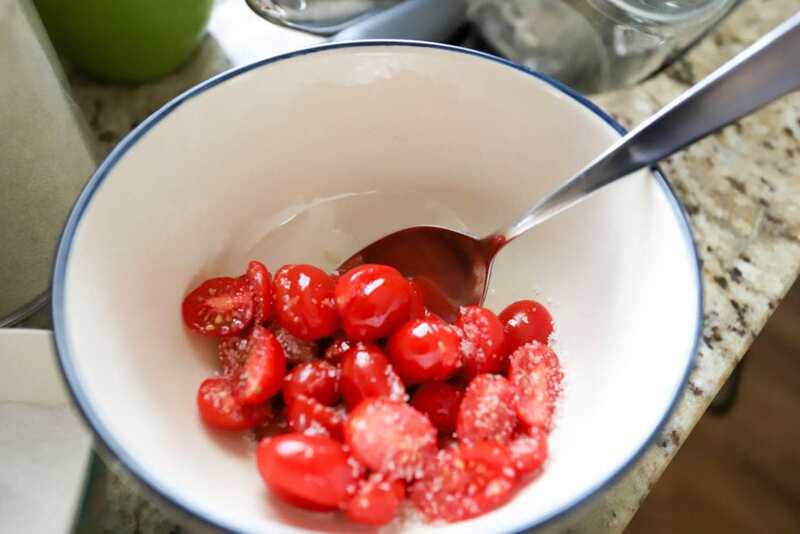 The tomatoes start with a little bit of olive oil, salt, and sugar. 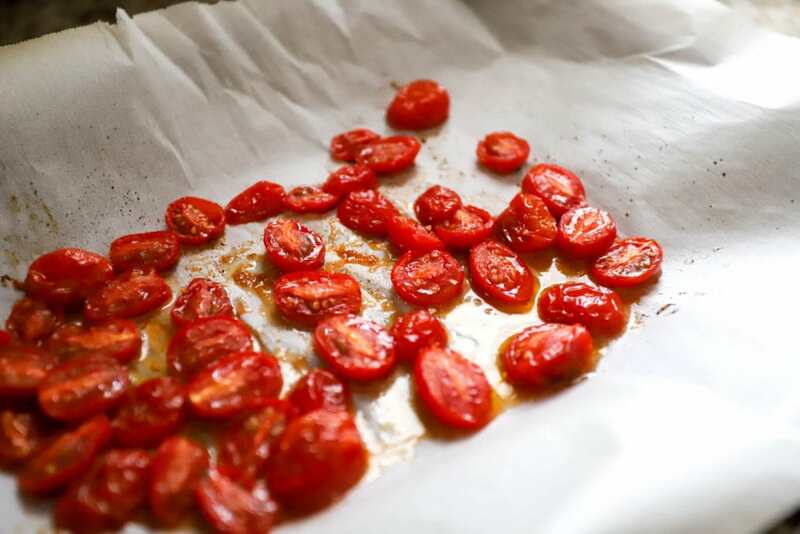 Toss the seasonings in a bowl with the tomatoes, or you can do this directly on a sheet pan for roasting. Preheat the oven to 400F. 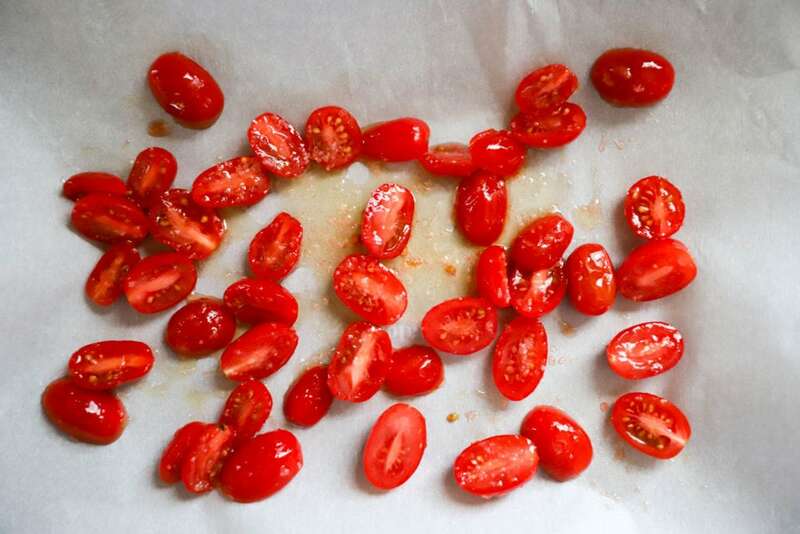 Place the tomatoes on a small sheet pan and roast them for 15 minutes or so. 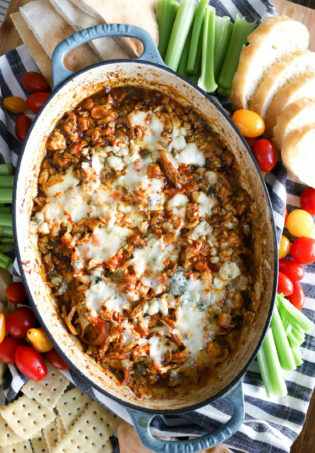 When the tomatoes are slumped have released some of their liquid, remove them from the oven to rest until you’re ready to serve the salad. 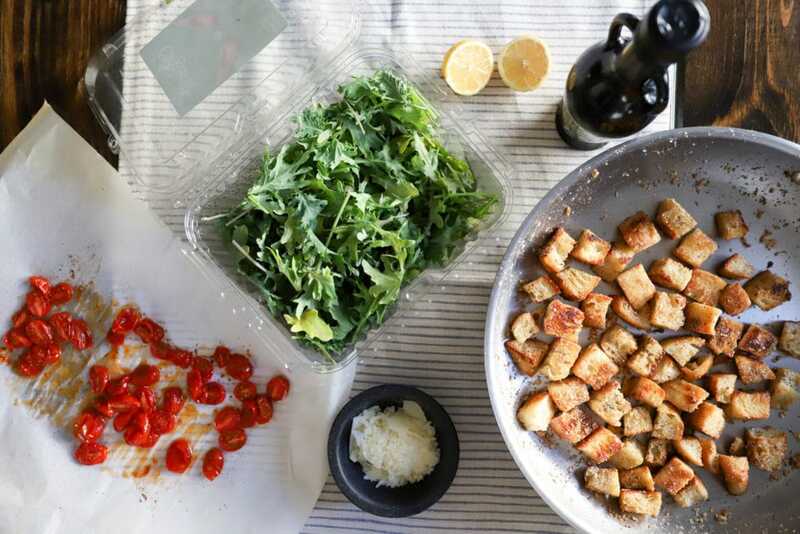 While the tomatoes are roasting, make the croutons. 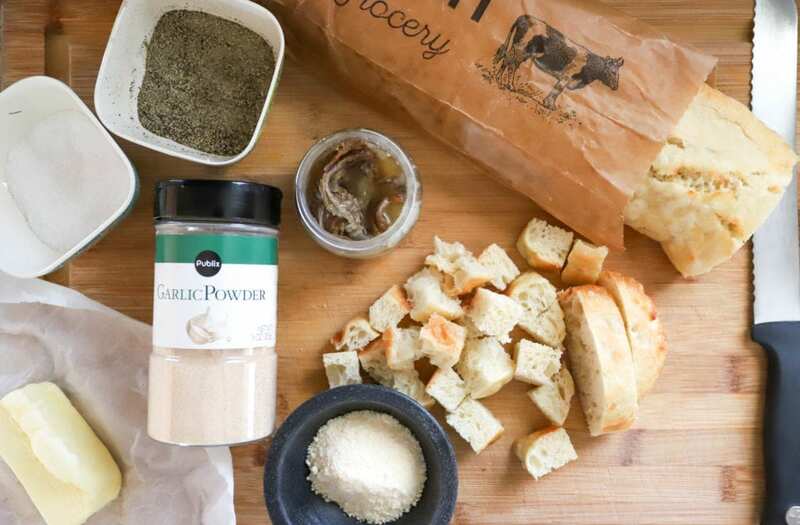 Butter, garlic powder, an anchovy filet, parmesan cheese, and salt and pepper flavor any bread you have on hand, cut into cubes. Start by melting the butter in a skillet with the anchovy filet over medium heat. As the butter melts, stir the anchovy around until it breaks up and melts into the butter. When the anchovy is mostly dissolved, add the bread cubes to the skillet and toss them around to coat them in the butter. Sprinkle the salt, pepper, and garlic powder on the bread. Now, we just let the bread cubes toast in the butter until they start to dry out a bit. 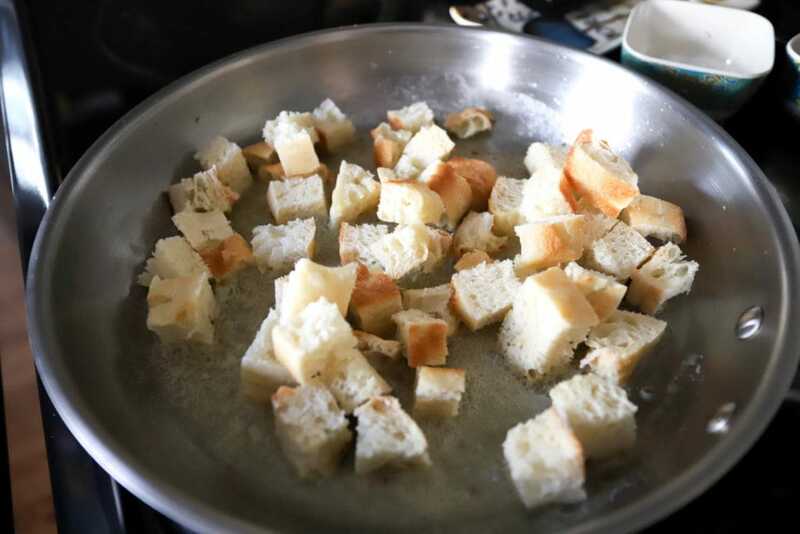 Toss the croutons every few minutes to let them brown evenly, and turn down the heat if the butter starts to burn before the bread cubes harden a bit. 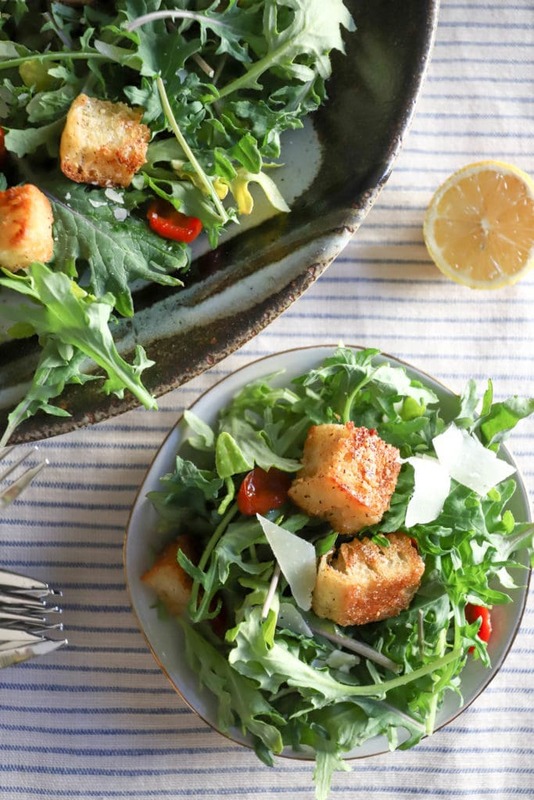 After about ten minutes, sprinkle the parmesan cheese over the croutons. Toss for another minute or two, then take the croutons out of the skillet to cool. They should be crunchy and golden and just slightly soft at the center. So now! 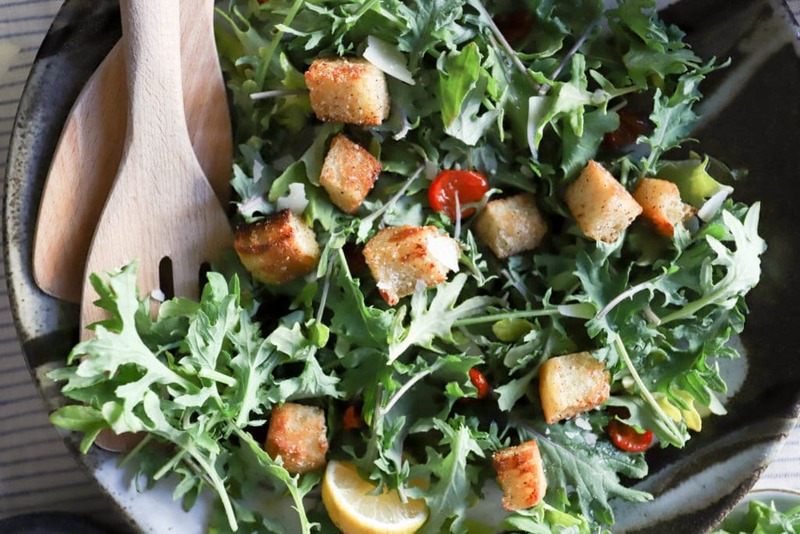 We have roasted tomatoes, croutons, kale, lemon juice, olive oil, and extra parmesan shavings. I wait until the last minute to “dress” this and just squeeze lemon juice over the whole thing and drizzle on a little bit of olive oil. 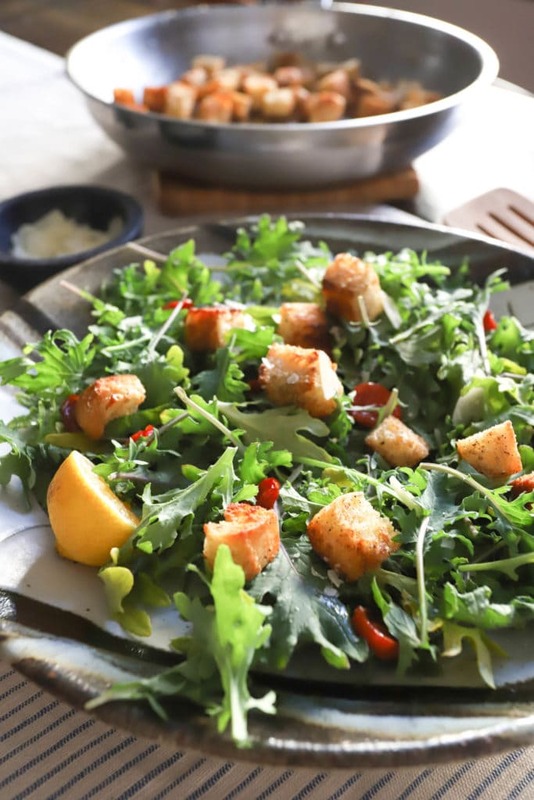 Because I don’t toss the salad (omg), I like a big plate or shallow bowl for serving so that the lemon juice and olive oil go on evenly over each serving and you don’t have to worry about saturating just the top of the salad. Then I sprinkle on parmesan shreds, the tomatoes, and the croutons. You may not need all the croutons here, but they keep great on the counter for a few days – croutons all week! Honestly, the croutons here are amazing on about any salad you can think of. The simplicity of this particular salad, though, lets the ingredients really shine and the flavors go together SO well. Roast the tomatoes. Preheat the oven to 400F and toss the tomatoes with the oil, salt, and sugar. Spread on a small sheet pan and roast for 15 minutes until slumped and just barely browned at the edges. Meanwhile, make the croutons. 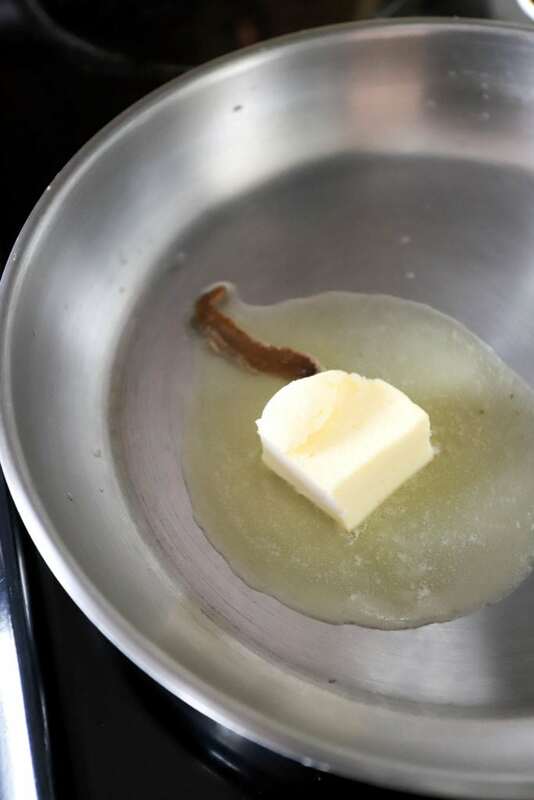 Heat the butter and anchovy filet in a large skillet over medium heat. As the butter melts, stir the anchovy into the butter to break it up. When the anchovy has melted and the butter is foamy, add the bread cubes. 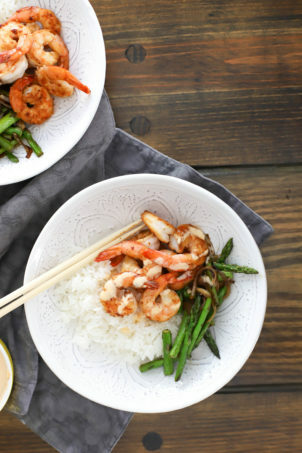 Stir to coat in the butter, and sprinkle with the salt, pepper, and garlic powder. 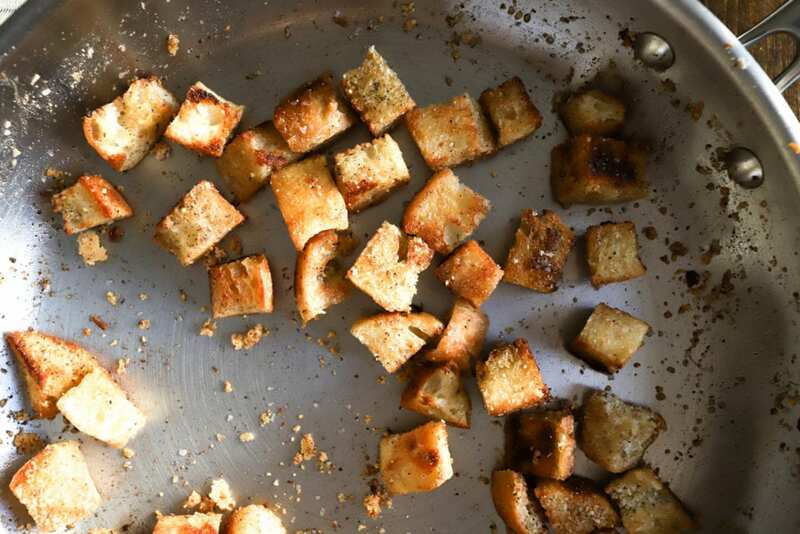 Let the croutons toast in the skillet for about ten minutes, stirring every once in awhile to brown on all sides and dry the bread out somewhat. When the croutons are no longer squishy and very brown, sprinkle the parmesan all over the croutons. Stir to coat, and cook for 1-2 minutes more until the parmesan browns and coats the croutons. Make the salad. Spread the kale on a large plate or shallow bowl. Squeeze the lemon juice over top and drizzle lightly with the olive oil (use more or less depending on your preference). Sprinkle with the parmesan and top with the tomatoes and croutons. I hope you like it! I’m super into salads without a proper dressing at the moment. Mainly because I’m lazy, but it works so well usually with just lemon juice and oil!